Adult day care has continued to be one of the most effective care centers for adults around the world. Not only is it affordable and effective, but it is enjoyable as well! Adult day care is a professionally-staffed facility that provides care for adults in a non-residential capacity. Adult day cares provide a means for limited health care, therapies, and social activities. Proper nutrition, medical attention, and medication monitoring are taken care of by staffs of trained and certified individuals. Adult day care at Brighter Living is a top class facility that strives to maintain excellence in every category of care for your loved one. If you are looking for an alternative to a nursing home, a substitution for at-home care, or if you just want to provide hands-on, professional care for your loved one, adult day care at Brighter Living is a superb option. We provide options for either full-day or half-day care Monday through Friday 8am-6pm, and we also supply healthy meals and bathing options. Brighter Living offers therapeutic activities such as music therapy, pet therapy, stretching and safe and supervised exercising. Other activities can include events such as movie watching, craft projects, cooking, and gardening! These activities can be done independently, but we encourage our adults to socialize with one another. 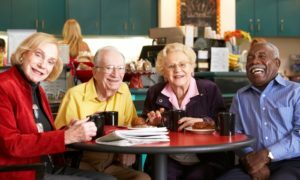 Socialization and friendship can reduce the risk of depression in older adults and allow a more fulfilling life. We work hard to ensure that every adult is social to their own level of comfort in our fully staffed facility! Our caring environment is fit for all ages of adults. We are staffed with compassionate and caring professionals who strive to maintain a social and enjoyable environment. Learn more about Brighter Living and our services at http://abrighterliving.com/about/ ! Book your FREE tour today of our facility in Harrisburg, PA! Previous Post Previous Post: Holiday Happenings at Brighter Living!